Many of the Street & Smith pulps had Christmas-themed issues. Here's one from the long-running WILD WEST WEEKLY. 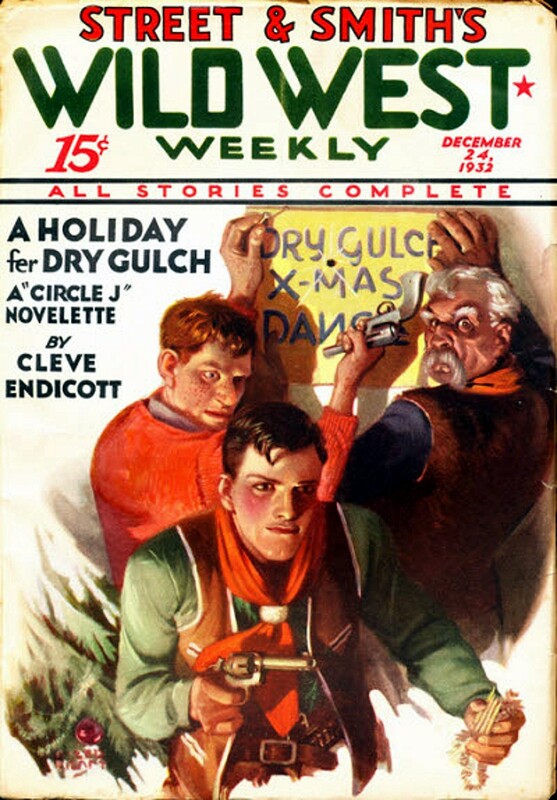 There are three Christmas stories in this issue: "A Holiday fer Dry Gulch", a Billy West/Circle J novelette by Lee Bond writing as Cleve Endicott, "The Whistlin' Kid Sees a Star in the East" by Emery Jackson (really J. Allan Dunn), and "Two Bags of Christmas Grub", a Lum Yates story by Galen C. Colin writing as Collins Hafford. I have to admit I don't know anything about the Lum Yates character, although I've read Circle J stories by Lee Bond and Whistlin' Kid stories by J. Allan Dunn (and of course many other stories by those authors, who are both top-notch). Other authors in this issue are Stephen Payne, William F. Bragg, Reginald C. Barker (writing as Lee Harrington), and Houston Irvine (writing as Philip H. Deere). I've never read an issue of WILD WEST WEEKLY that I didn't enjoy, and I'm sure I'd like this one, too.